There is so many teas I would be happy to share with you. Not only to write here about my experiences, but rather to prepare water and steep leaves for you. Light charcoal, clean cups, pick up some leaves from my new cabinet. Sit down please, and have a cup of tea. If you can listen to music when you read this, you can try put on this version of Sting's Shape of my heart. I like it. Yesterday, my morning was about sheng puehr cha from 1997, today then from 1998. I am not drinking them in line to make a competion. I just celebrate and enjoy days after our last firing of this year. When it comes to celebration, then aged tea is more then welcome here. First sample, the 1997 Big Red Mark, I have bought at Chawangshop, second then, The 1998 Fuhai, from TeaUrchin. 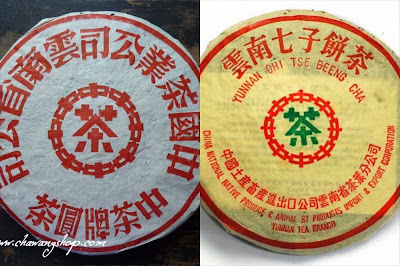 Both teas have several similarities, like faces of two guys from far away country. They can look the same at first. Not just that they are both almost of the same age and similar in pricing (in both cases is close to 170$). They were also stored in humid areas, both in warehouses. Leaves of both cakes will be probably mixtures from different places and qualities. And I can tell, it was joy to drink both of them. Big Red Mark is the calmer brother here. It starts with lighter smell of dry leaves and ends with more settled qi performance at the end. Even when I was not drinking those tea side by side, slight but, clear differences were obvious. The Red mark is more "done". Forest aroma of wet leaves, resin and woody aftertaste with some nice bitterness from second to fourth infusion. Many brews, patient leaves. Meditative and medicinal tea. For those who look for colorful fragrances it might be letdown. Not for me. I dont know were the purchasing officers from newly seperated Fuhai factory spent their 1998 spring. But I would guess: leaves for this cake grown in Yiwu. This tea is stronger, more distinct. Forest honey and heavier colored flowers go though my nose, my mouth, my throat and become part of me. Energy is vibrant, and the tea shows live and still a bit of rush. There is still some spece to grow, to age. When I can not advice to buy any of those cakes blindly, I would recomment to sample them when you get a chance. 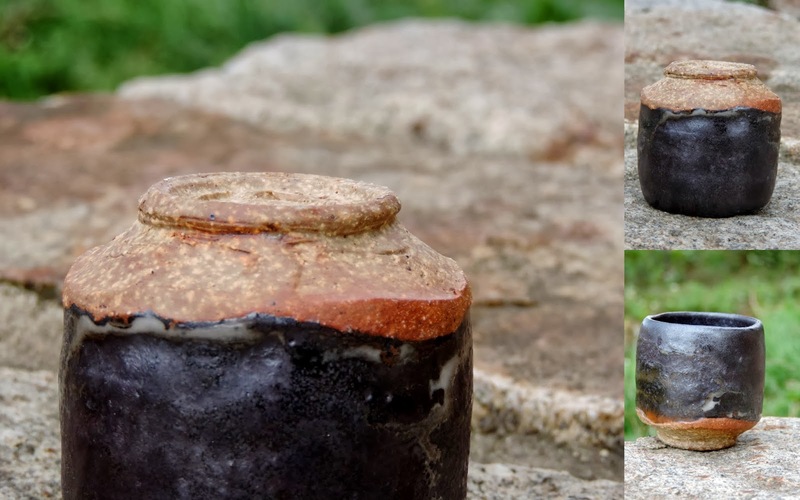 Those are good examples of wet stored, aged teas, without moldy/muddy look, smell or taste. When 170$ can sound like expensive, it is (unfortunatelly) not over the roof these days. One way or another, if one like age puehr, it is easier to seek for teas with some age and quality then to dream about aging fresh cakes on our own. It is fun too, I still put aside some fresh leaves every year, but we have to admit...there is too much but and maybes. Gems number nineteen and twenty. It means that we already make one round. There are no pots in my collection from The First Ten. Gems nine and ten are going to meet their new (patient) owners. The Straw in the Grass chawan is already with my dear Norman tea friend. And The Blue Jasper teapot is ready to fly to sunny California (with first snow behind my window, I wish to fly with it...). Say goodbye to those pieces, I love them both. Gem number nineteen is (again) teapot. Stoneware, unglazed inside, with few splashes of shino glaze on outside. I usually try to define why I choose a particular piece for my collection. Here is was not just because it is nice. There is more. When you hold in your hands it feels right. You really want to put some leafs in and make some tea. To use it. And that is first sign of the good teapot, isn't it? Gem number twenty is small shiboridashi set. I like the magic blue of this ash glaze. 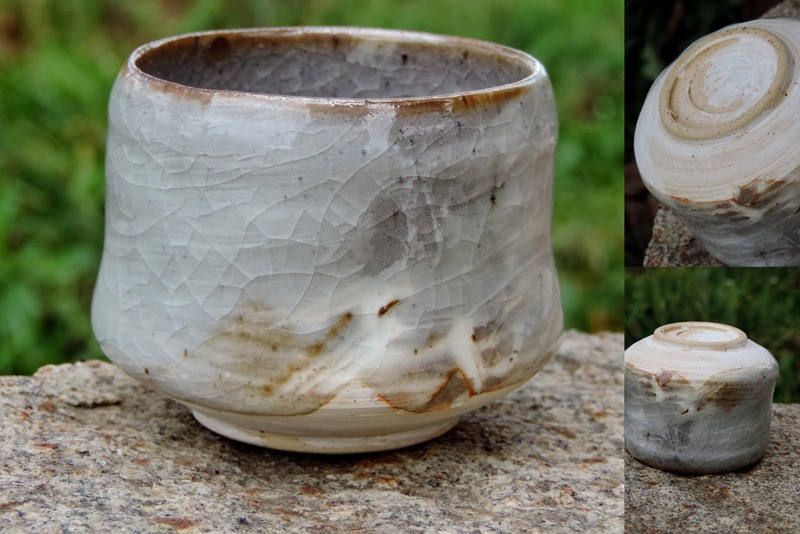 We use this glaze all the time (you can also see it on Blue Jasper above). The clay makes the trick. I used here one of the natural clays I was talking about here. Yes, the black one. This set stays with me also as reminder of this wonderful clay and of my pledge to work with it much more in the future. 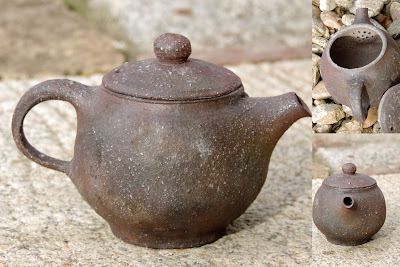 When talking with a teaware enthusiastic, I can be pretty sure, some variation of this question is going to pop up: "How natural are your clays"? I can replay that clays are natural by nature. But this answer would not go to the point, would it? Clays can be mixed together and grinded to desired characteristic. Clays can be also enrich by natural as well as more or less artificial additives: river sand, quartz, grog, feldspar, iron scales, saw dust, oxides of different metals or other colorants and so on... the list can be quite long. 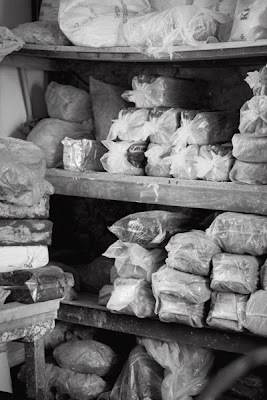 Clay companies usually creates recipe of new clay by mixing several clays from several mines/deposits, then grind them to fine, seamless clay, add grog of certain grain size as bones of the clay and other additives, if needed. All is mixed again and "pug-milled" to plactic bags. Such bags are then waiting for potters as we are, ready to use. Or, in order to create our own recipe with special quality we are looking for, can be mixed and adjust again. 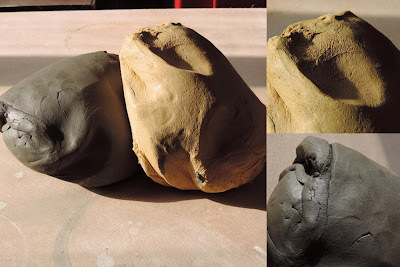 This practice have quite a few obvious benefits and most of our clays come to our studio this way (we pay attention to companies we buy from - clay have to be simple, without any artificial colorants or additions). Getting clays this way means less of the hard work, stable clay body and pretty wide range of different clays to work with. But there is few things missing and that is why we keep searching for really natural clays. 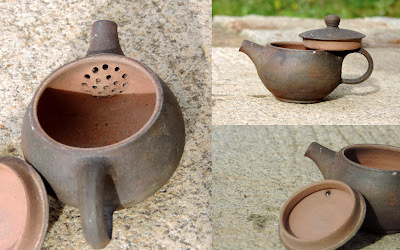 1) Clays, which you dig directly from nature are unique and you want that for special pieces. Even from the same deposit clay will vary, if you use clay from different spot or depth. 2) When one use natural clay then it is usually just sieved from too coarse particles. Such clay is not grinded, which means that there are grains of different materials in different sizes, the whole spectrum compare with uniformly grinded manufactured clay with added grog. 3) Using natural clays brings new live to potters life. Getting know a countryside, where clays are resting for thousands years, being close and familiar with material we work with - it all helps to give enegry to final pieces. During the summer I was happy to meet two new clays, both clean and natural. One was given to me by friendly colleague, second one I found thanks to coincidence, when having a trip with friends, looking for summer swimming. The yellow clay is more rough, my friend probably have not sieved it at all. The black one is more plastic, greasy like. When I started to make first pieces from those clays I already have a rough idea how they are going to look like. I have seen one piece from the yellow one (fire by my friend) and I make few test cones from the black one. Both clays are very nice to work with, so nice that I decided to brake my plan. Instead few test cups, I end up with teapots, cups, yunomies and yes, a couple of jars. color was of organic origin and it burn out.